This is the first of several articles detailing the changes to the DACA program announced on Tuesday September 5, 2017. This is meant to give quick and dirty information, whereas the next one we will: (1) get our emotions out; (2) plan our resistance; and (3) offer ideas how DACA holders can protect themselves. Sandwiched between the natural disasters of Hurricanes Harvey and Irma, the Trump administration unleashed its own man made disaster by eliminating Deferred Action for Childhood Arrivals (“DACA”) on September 5, 2017. Rather than explain a decision that upends the lives of 800,000 DACA recipients and their families and thousands of employers, the President sent his Attorney General, Jefferson Beauregard Sessions, to read a wooden statement and depart without any questions. Sessions claimed that the threat of litigation by a group of states led by Texas prompted the administration to conclude that the program was indefensible. So the Attorney General announced the “orderly wind down” of DACA. All DACA classifications and employment authorization will be valid until they expire. Pending applications for both initial and extensions of DACA classification and employment authorization will be decided under the DACA rules. No new initial applications will be accepted after September 5, 2017. For DACA beneficiaries whose DACA expires between September 5, 2017 and March 5, 2018, extensions must be filed before October 5, 2017. If granted, employment authorization will last for two years. Applications for advance parole for DACA beneficiaries will no longer be granted. We have witnessed a lot of sadness over the end of DACA. But we have seen a lot more resilience. Dreamers got DACA for themselves and are now a potent and organized political force. If you are despairing over DACA, please remember that there are millions of people who have your back and are ready to fight for you every step of the way. 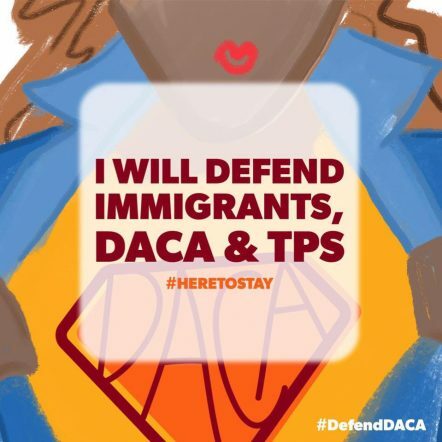 I support DACA and all those working to keep it.